As a leader, developing your Leadership Team is the biggest single value opportunity available to you. Whether your team is reasonably effective or more dysfunctional, you’ll know that it could work much better. What you may not know is just how much difference it could make – both to your bottom line results and to your working experience. The good news is that developing your Leadership Team is easier than you might think. In this comprehensive and practical book, Chris Henderson sets out clear strategies for better understanding your Leadership Team and how you can get the most from it. 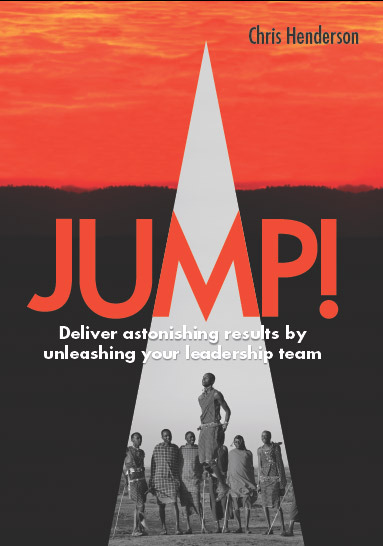 It’s also packed with practical ideas, tools and case studies – and even insights from the author’s personal experience of the Maasai and how much their powerful collective approach to survival and success in the Savannah can teach us in the Boardroom. “A really well written and wise book. It is the first thing I’ve read that concisely gets to the beliefs and actions that I really think make the difference for leadership teams, and makes the case & tools for developing them. I can think of many people who I want to read this book and take action. It’s not often that I pick up a book and literally don’t want to put it down until I’ve savoured every word. This book was one of those, and will undoubtedly appeal to anyone who is interested in the dynamics of Leadership Team performance. I found the tools and case studies particularly useful. The book even contains fascinating insights from the author’s experience of the Kenyan Maasai people and how their collective approach to success has much to teach us in the Boardroom. JUMP! acts as an important reminder to constantly think about how leadership teams can improve. It’s essential reading for even the busiest executive. Chris Henderson has designed a brilliant introduction specifically for busy leaders who need to quickly get to grips with their team. His introduction gives a convincing diagnosis of the problem of modern leadership and offers a framework that is both simple to adopt but also rich in potential. Although this book rewards the ‘quick dip’ approach (with superb diagrams, well laid out boxed highlights and a comprehensive ‘toolkit’ annex) I’m deeply impressed with the quality and clarity of thinking in this book, and convinced that it merits more careful detailed reading. I’d recommend this book for busy leaders who want a simple framework to help them get to grips with their teams but also for those who are interested in a deeper read to support group coaching within organisations. I expect Jump! will stay near the top of my working pile of books, becoming increasingly marked up with highlighters & post-it notes – a really useful working text! Chris nails the rationale for the book: Too much individual focus on leadership and not enough on the leadership TEAM. I warmed to that as I read through the book. Most leadership teams are dysfunctional – and I don’t know many people who would disagree with that. Clearly not ALL but most. It’s referred to as the open secret. Leaders are functional experts (Marketing, Finance, Operations, Research, People, Learning) but not necessarily a good team. And that, Chris asserts – is the main problem we should tackle. Chris uses some nice phrasing and shaping: “Organisational gravity” as the cluster of things that stop leaders being successful together like the short-term profit pressures; politics (erm, everywhere) and the need for less heroes and more teams. Chris’s use of the Maasai wisdom was to bring to life these conversations with stories from the tribe, its leaders and community and then play them into the corporate world with a corporate story. The Maasai stories were vivid and interesting. I liked Chris’s 6-page executive summary and there was a temptation to repeat that in the book review. I persisted beyond that and found that exec summary a really nice addition to the book. Commendable to recognise how many leaders are busy, frustrated and lacking fulfillment and another book to wade through without revealing the secrets early on wouldn’t have helped. So overall, if you’re that CEO/CXO and have the desire to really work your leadership team into shape for something better, if you’ve already read and want to leverage Patrick Lencioni’s “5 Dysfunctions of a Team” and weave in Chris’s work to your game-plan, you should start moving from (as Chris calls it) silos of misery to a cross-functional, intertwined leadership team setting strategy to work and delivering that elusive high performing executive promise that appeals to their own people, customers and shareholders alike. 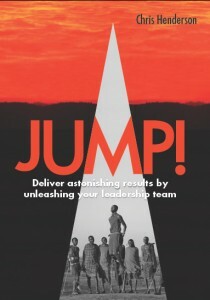 Chris Henderson’s new book Jump! arrives with an interesting premise – that no leader can thrive until they have developed their senior leadership team. Its pages are packed with practical exercises to grow the people around you.